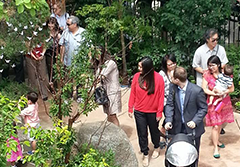 The MBT Legacy Garden, which was dedicated on June 22, 2014, is “an oasis of peace and inspiration for the Buddhist community and larger public alike,” says its designer, world-renowned landscape designer Hoichi Kurisu of Portland-based Kurisu International. This nurturing garden was conceived to honor the first- and second-generation Japanese-American pioneers who founded the Midwest Buddhist Temple here in Chicago. With Japanese temple garden design principles, the garden is in perfect balance with the architecture of the temple. And represents a perfect thank you to the generations who made certain that the Midwest Buddhist Temple will continue to grow. A final signature piece is a Japanese cedar gate at the western edge of the garden, custom-made for the Legacy Garden. If you would like to support the maintenance of the garden, contributions are tax-exempt and tax receipts will be provided. We welcome you to join in as a garden volunteer. Volunteers are needed to serve as garden docents, or interpreters, as well as to perform general light-duty garden maintenance. Experience is not necessary. If you are interested in volunteering in the garden, please contact us at office@midwestbuddhisttemple.org or call 312.943.7801. The MBT Legacy Garden is open to the public the first Sunday of each month—April through November. Private tours are given by appointment. To arrange a tour, please contact us at office@midwestbuddhisttemple.org or call 312.943.7801. For more information about our Legacy Garden, please follow this link: mbtgarden.org.